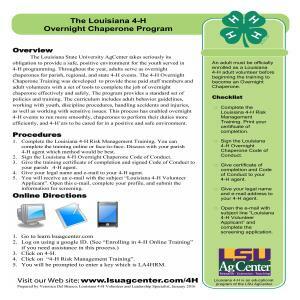 Overnight Chaperone Training is now online. Please follow the directions below to complete the training process by accessing our online training system. This new system allows volunteers to complete the training at their own convenience. The training can either be viewed as interactive training modules or printed out in a pdf version. Once the volunteer has completed the modules, they must take the 4‐H Risk Management comprehensive quiz. You will have 3 attempts and an unlimited amount of time to take the quiz and get a 90% or better score. Once you take the quiz with a 90% or better, you can access your certificate. Please email or fax your certificate to your parish 4‐H Youth Development Agent. Once your parish 4‐H Youth Development Agent submits your paper work, you will receive a letter in the mail confirming your training. If you have any questions at any point in the process, please contact the 4-H office. Email: JoAnna Pesson or Megan Roberts for more information . You can also contact the Tangipahoa Parish Extension Office.